I came across this image on Twitter about five or six months ago and my heart basically skipped a beat. This keyboard is a Microsoft product, and as such doesn’t have direct compatibility with macOS. This keyboard is powered by AAA batteries rather than having a built-in rechargeable battery. This keyboard has had connectivity issues with (what appears to be) specific Macs. I’ll touch on each of these in a bit. What do those two purposes sum up to? The result is a keyboard that looks great in setup photographs but gums up the moment it leaves the studio. The Surface Ergonomic keyboard pins neither of these goals to the top of the list. This keyboard is built for comfort, ergonomics, and speed. A dash of aesthetics are thrown in, but comfort and ergonomics rise to the forefront. 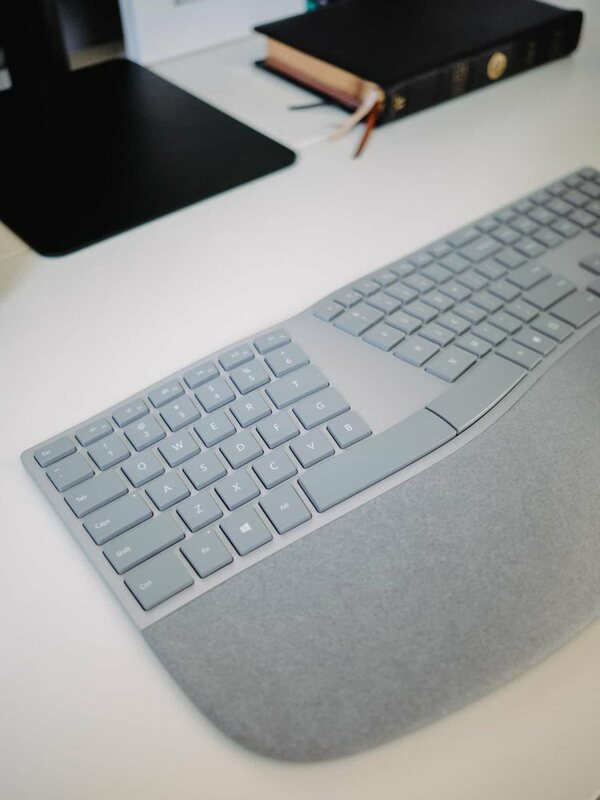 The Surface Ergonomic keyboard is the successor to the original Microsoft Sculpt keyboard. 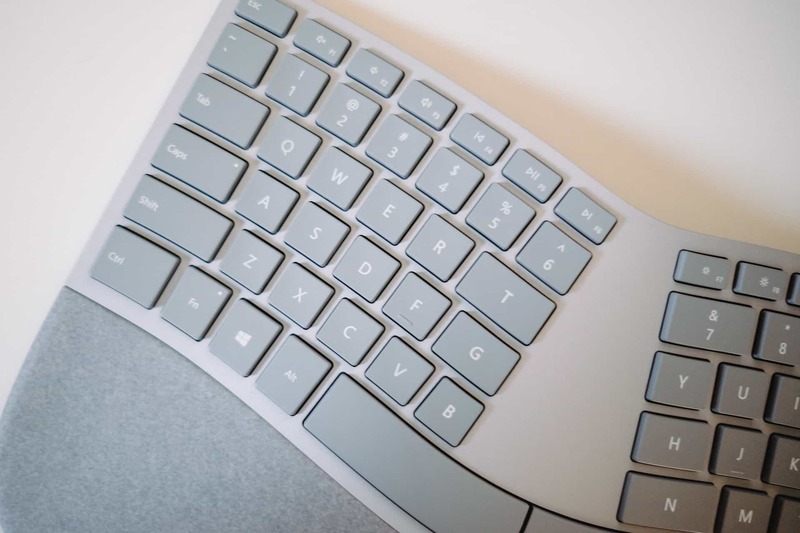 Where the Sculpt cut out the section between the “T, G, B” and “Y, H, N” sections of the keyboard, the Surface Ergonomic fills it in with aluminum-colored plastic material used throughout the rest of the keyboard. 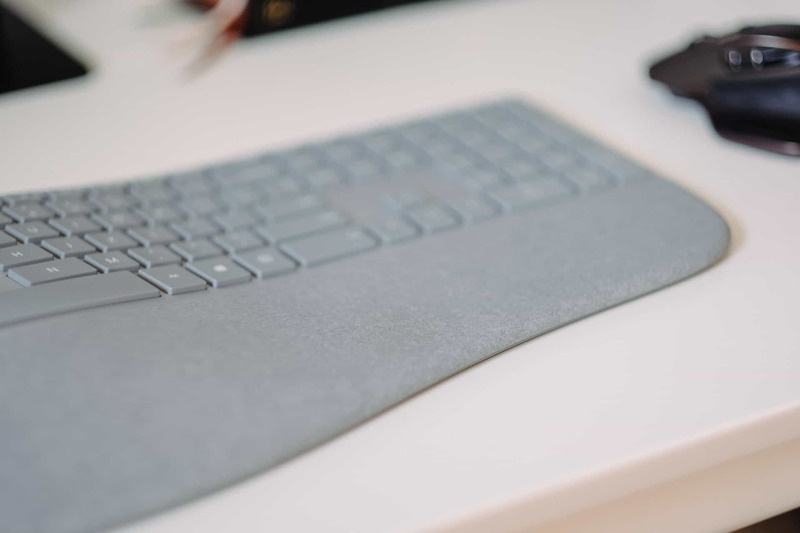 The Sculpt generation included a standalone number pad, whereas the Surface Ergonomic includes a built-in number pad. Some folks preferred the cut out and standalone number pad in the Sculpt generation, but I think the larger, bulkier Surface Ergonomic is better suited for most people’s needs. Where the Sculpt generation got things right was in the wrist riser (if that’s what you want to call it). 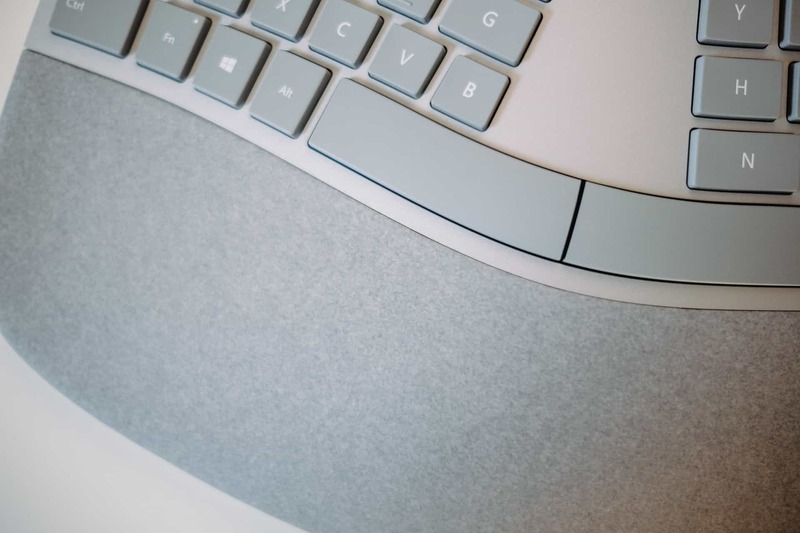 The Surface Ergonomic includes a wrist base made of its now ubiquitous Alcantara material. 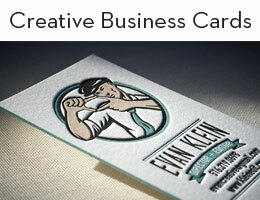 This material is soft to the touch, but dense enough to provide proper support when typing. It also has a particular fashion to it that only Microsoft can pull off these days. The Sculpt keyboard, on the other hand, had optional accessories for raising the bottom of the keyboard, thereby positioning your hands down and away from your body as you typed. 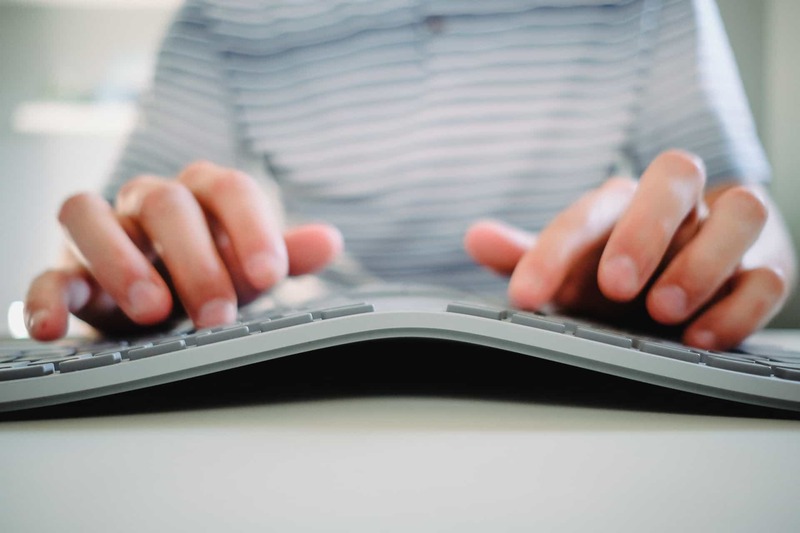 For ergonomists out there, this is the ultimate form of typing — hands and wrists curved to the middle of the keyboard and positioned down and away from your chest. It may appear a tad wonky when explained in words, but I’ve been reassured this is quite the comfortable typing method. This may be the one area where Microsoft cast aside comfort and ergonomics in favor of pleasing aesthetics and minute tolerances. 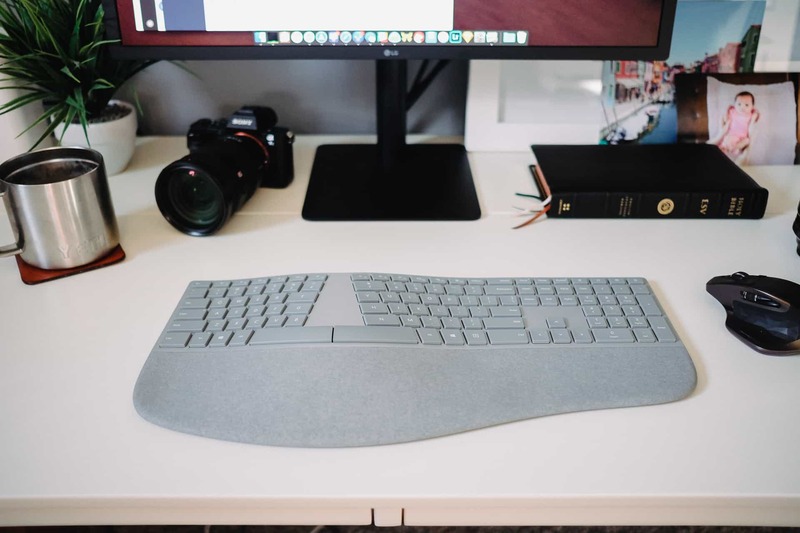 I have no experience with the first generation Sculpt, so I speak from a third-person perspective: I’m happy with the aesthetic trade-offs between the two ergonomic keyboard generations and I greatly appreciate a built-in number pad. My major complaints (and I have been doing a lot of complaining recently) with any of Apple’s recent keyboards is the resounding lack of feel. I chalk this up directly to the minute tolerances of that butterfly switch — there is no forgiveness in any part of any key, resulting in a keystroke no matter the amount of pressure applied. Apple labels this is a selling feature. I label it a failure. Regardless, each key has considerable key travel when compared to any Apple keyboard and has an inviting feel. 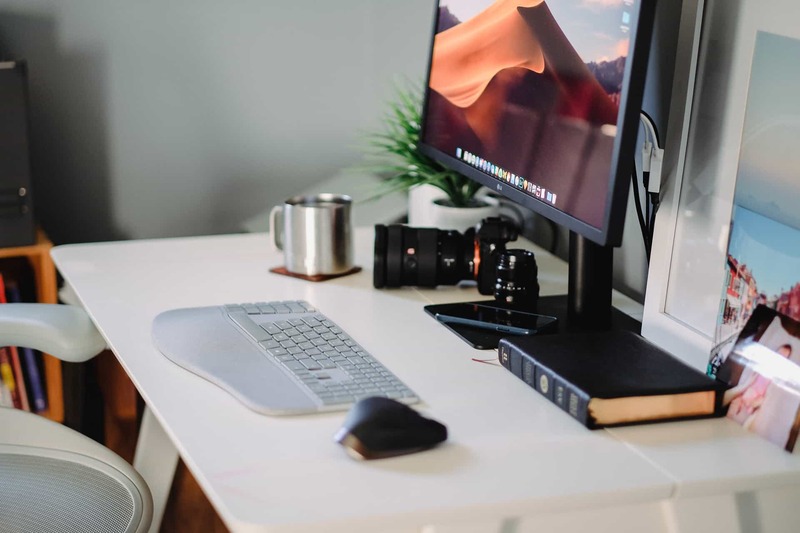 Each keystroke has great depth and resistance, as though the key kind-of-sort-of wants to be pressed, provides a little resistance, then quickly returns to its home position after being fired. Apple’s keyboards have such limited travel that heavy typists will almost certainly feel their fingers bottom out when they really get going. 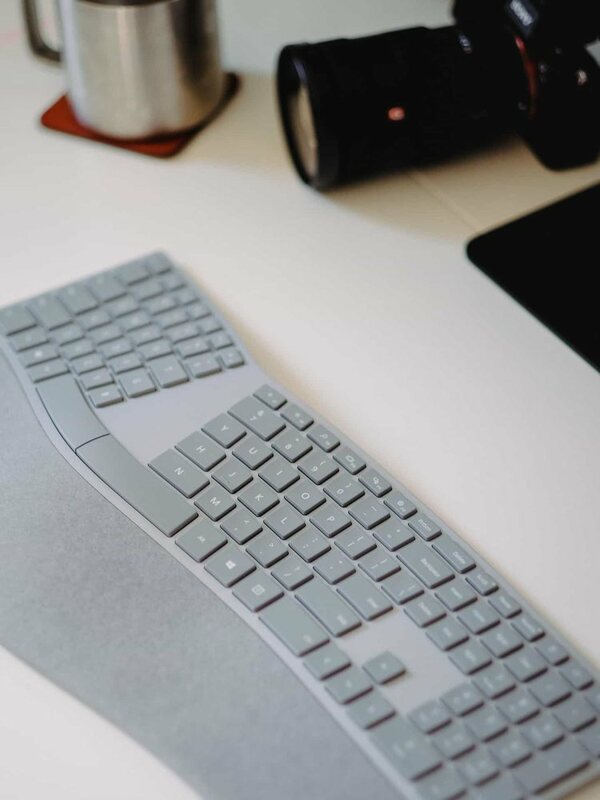 Microsoft’s improved depth, great key travel, and perfected resistance give it a tremendous feel and has considerably reduced the strain on my fingertips after long periods of writing. Despite the larger key travel, the Surface Ergonomic is orders of magnitude quieter than the MacBook Pro keyboards. The keystroke sound comes in at a lower octave than any Magic Keyboard actuation and better blends into the background of the noises reverberating throughout my house. Of course, this is somewhat of a split keyboard, so it’s not meant for all types of typists. My wife gave it a shot and immediately became infuriated with the placement of the keys. For touch typists or for those who have to look down on occasion when inserting punctuation from the numeral row, a little transition period is in order before becoming comfortable with the layout. The Alcantara wrist base is also worth mentioning. When I really get going, my wrists tend to get a bit sweaty and the outside bone on my wrist often gets tired of the friction with the desk. In both cases, the smooth, foam wrist base of the Surface Ergonomic eliminates any stress points and keeps my fingers and wrists aligned in a comfortable format. I won’t lie, either: the Alcantara wrist base looks plain cool. It has such an inviting look to it. Pitching a Microsoft keyboard to a predominantly Apple crowd may come with a few raised eyebrows, particularly due to compatibility concerns. Function keys don’t align with Apple’s built-in functions while command keys are labelled and function differently between OSes. Out of the box, the Surface Ergonomic’s “Windows” key in the bottom left command row is mapped to the “Command” key on Apple keyboards. “Alt” is “Alt” and “Ctrl” is “Option.” If you can somehow get around this and retrain your muscle memory, you won’t have to do any remapping. I jump between Windows and Mac every day, so I have quickly grown tired of trying to retrain muscle memory. As a result, I quickly downloaded Karabiner to remap keys on the Surface Ergonomic to approximate each key’s location on a regular Apple keyboard. “Alt” is now “Command” and the Windows key is now “Alt/Option”. This brings the experience fairly close to Apple’s own keyboards. 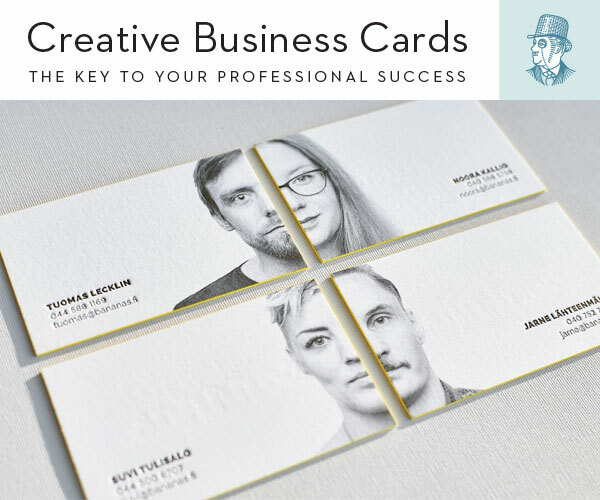 The function row can also be remapped, depending on which functions you normally use. On macOS, the default “ScrlLk” and “Pause” function keys change screen brightness, while the audio controls on the left side of the Surface Ergonomic’s function row function as advertised. These are the only function keys I use regularly, so I haven’t bothered remapping. 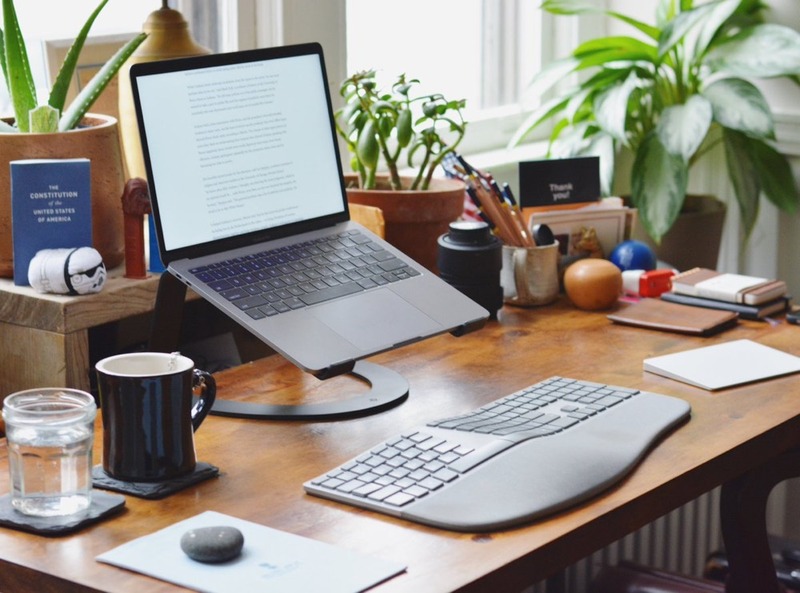 A friend of mine who purchased the Surface Ergonomic in the days around its launch complained heavily about the Surface Ergonomic’s connectivity to macOS. His frustration resulted in his returning the Surface Ergonomic keyboard, despite the fact that he loved the keyboard’s feel. He wasn’t alone either — there are numerous reports online that highlight the Surface Ergonomic’s connectivity issues in its early days. So far, I haven’t experienced anything that should raise eyebrows. I have noticed general Bluetooth drops as a whole, but this isn’t directly attributable to the keyboard. These Bluetooth drops also take place with a Magic Keyboard, so I won’t be pointing fingers at anything. On the plus side, the Surface Ergonomic does have one connectivity trick up its sleeve, which I think Apple should adopt immediately: When you fire up your sleeping computer with the keyboard, any keystrokes you input are saved and then inserted after the lagged Bluetooth connectivity period. This means you can instantly type your password and not have to wait for macOS and the keyboard to connect before inputting your password. This is a lovely touch and one which seemed so natural, I didn’t realize it was working until someone pointed it out to me. Microsoft ships the Surface Ergonomic with two standard AAA batteries, which it advertises have a life of 12 months of use. I’ve had my Surface Ergonomic for a month, so I’m afraid I can’t comment on its long-term lifespan. It’s nice not having to tie up a USB port to charge the keyboard every month or two, but having to go out and purchase a pack of AAAs just for my keyboard is a bit of a bummer. Most desktop keyboards don’t seem to be backlit these days and neither is the Surface Ergonomic. I use mine in front of an LG 27-inch UltraFine display, so the brightness of the display lights up the keys at all times of the day. This will surely allow those AAA batteries to last a little longer as well.